The decision of the All Progressives Congress at its National Executive Committee’s meeting on Wednesday on the use of direct primary to elect its candidates for the 2019 general elections is causing confusion in the party. Why are Governors not ready for such transparency? Investigations by The Punch revealed that while some states had embraced the direct primary method, some insisted on the indirect method. Others however said they would need to meet to seek a workable solution to what they referred to as conflicting directives. Some of the states’ executives of the party, who spoke with our correspondents on Saturday, argued that the NEC was unambiguous in its decision on Wednesday when it declared that only direct primary would be used to elect the presidential candidate. The party leaders in the state said the confusion occurred on Friday when the party issued a statement, declaring that other candidates, alongside the presidential candidate, would be elected through the direct primary method. In Imo State, the state party executive said it would adhere strictly to the decision of the NEC of the party to adopt direct primary in the election of its candidates for the 2019 general elections. Speaking with The Punch on Saturday, the Publicity Secretary of the party in the state, Jones Onwuasoanya, said the NEC’s decision was final. “We will strictly adhere to whatever decision was taken by the NEC, being the highest decision-making organ of the party. We are loyal and committed party men and we are interested in the success of the APC,” he said. But the Chairman of the party in Ondo State, Mr. Ade Adetimehin, said the state chapter would go for indirect primary. However, the Senator representing Ondo North Senatorial District, Ajayi Boroffice, said the direct primary option would be adopted for all elections in the state. Boroffice, who spoke through, his media aide, Mr. Kayode Fakuyi, also stated that he stood by the position of the NEC that all primaries should be direct. He said, “I wish to congratulate the National Executive Committee of our great party for coming out boldly to adopt direct method for the conduct of primary elections at all levels. We are ready for it in Ondo State." Also, the Benue State chairman of the party, Abbah Yaro, said on Saturday that the party was ready to conduct direct primaries for all aspirants in the state as directed by the national leadership of the party. “The emergence of all our candidates must come from the people. If we are going to adopt the indirect primary, we would definitely call a stakeholders’ meeting and if the majority of the people disagree with the direct option, we will carry the NEC along,” he stated. The Director of Publicity, Research and Strategy of the APC in Osun State, Mr. Kunle Oyatomi, said the party executives in the state had not decided whether to use direct primary or delegate system in electing its candidates. The Chairman of the Ogun State chapter of the party, Chief Derin Adebiyi, said the state had yet to decide on whether to use direct or indirect primary. Adebiyi said going by the decision reached at its NEC meeting last week in Abuja, each state was at liberty to adopt any method. Also, the party in Katsina State, said it had yet to take any decision on the matter because of the confusion arising from the information received from the NEC meeting and the statement issued by the party on Friday. The executive committee of the party in Anambra State said it had not decided the type of system to adopt in the election of its candidates in the state. The immediate past state chairman of the APC in Akwa Ibom, Dr. Amadu Atai, said the state executive committee would deliberate on whether to adopt direct or indirect primaries very soon. According to him, the party tilts towards direct primaries except if there is a contrary directive. The Edo State chapter of the APC said it had yet to take a decision on the directive given by the NEC. The State Chairman, Mr. Anselm Ojezua, said, “The decision of NEC recognises the three modes by which the choices can be made under the constitution of the party as consensus, direct and indirect primaries. In the same vein, the Chairman of the APC in Oyo State, Chief Akin Oke, told one of our correspondents that the state chapter of the party would have to deliberate first on a position to adopt before making its preferred choice public. “I was at the NEC and we made our presentation. I will not want to say anything about the choice to adopt now until we submit our report and deliberate on what to do. It is not a choice I have to make,” he said. In Bayelsa State, the Organising Secretary of the APC in the state, Mr. Tonye Okio, said the state chapter would strictly abide by the directive of the national secretariat on the mode of primaries. Okio said, “The directive is clear. The directive states that only the President will go through direct primary, while others from the Senate downward, will go through indirect primaries. A senatorial aspirant in Bauchi South, Lawal Husseini, told one of our correspondents on the telephone that he was comfortable with any method that would be adopted by the party. “As far as I am concerned, it is how you organise it that matters. If it is rigging, some people are thinking that you cannot rig by one side. But whether it is direct or indirect primary that is adopted, if you want to rig, you will rig, because the person organising the indirect primaries is the same person that will organise the direct primary,” he stated. Another aspirant of the Katagum Federal Constituency, Musa Azare, said the position of the party was a welcome development. The state chairman of the party in Taraba, Alhaji Abdulmumuni Vaki, on Saturday, said the exco of the party in the state would adopt the indirect primary to select its governorship candidate for the 2019 elections. Vaki in a telephone interview with our correspondent said, “We, the exco of the All Progressive Congress in the state, have decided to go with the directive of the national secretariat to conduct direct primary. “Those seeking the party’s governorship flag should go and lobby the delegates. Meanwhile, fresh facts have emerged on why the leadership of the All Progressives Congress revisited the issue of the process for the election of candidates that would fly the party’s flags during the 2019 general elections. The party had, after its National Executive Committee on Thursday, announced that only the election of its presidential candidate would be by direct primary while that of others would be by indirect primaries as allowed by the party’s constitution. Investigations revealed that the initial decision was arrived at following the pressure mounted on the APC leadership by its governors who saw the adoption of the direct primary as a threat to their positions as leaders of the party in their respective states. A chieftain of the party had hinted one of our correspondents on Thursday, shortly before the commencement of the NEC meeting, that six governors of the party met with the National Chairman, Adams Oshiomhole on Tuesday night and told him that their colleagues were not favourably disposed to direct primaries. The source had explained that two of the governors were from the North-Central; one from the North-West, and one each from the South-East, South-West and North-East. The party chief added that all the states’ helmsmen, except the governor from the North-East, admitted that they had problems with the state party chapters, hinting of their fears that there was a possibility that they and their loyalists vying for offices might not get the party’s ticket if they should embrace the direct primary option. They equally expressed the fears that the APC could lose their states if direct primary was allowed to hold. The source, however, said the APC chairman was firm and resolute on the position of the party and that the NEC meeting would merely ratify the position of the party’s leadership on the issue. 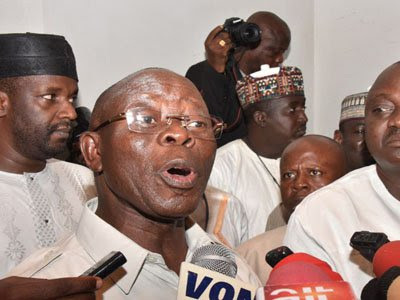 Oshiomhole, according to the source, told the governors that President Muhammadu Buhari and the national leader of the party, Asiwaju Bola Tinubu, among other critical stakeholders, were also in full support of direct primary. The source added, “The party chairman explained to his the governors that the adoption of indirect primary in the election of the APC candidates for the Ondo and Ekiti states’ governorship elections affected greatly the integrity of the party. It was learnt that the governors, who met Oshiomhole, were not impressed by his explanation. They also threatened that they would not allow direct primaries in their states.